Welcome to Part 4 of this 5 part series! If you need to get up to speed here's Part 1, Part 2, and Part 3. Paint makes for the biggest change in a room. Whether you're painting an accent wall, one room or a whole house. Like we just did. The changes are remarkable! And actually in the whole scheme of a home makeover fairly easy and inexpensive. I think sometimes we wait too long to give our homes a fresh coat of paint, but trust me the pay off is HUGE!! I tend to stay in the neutral category for wall color. Then you can pull in more colors through pillows, rugs, throws. This is an excellent list of great neutral colors. 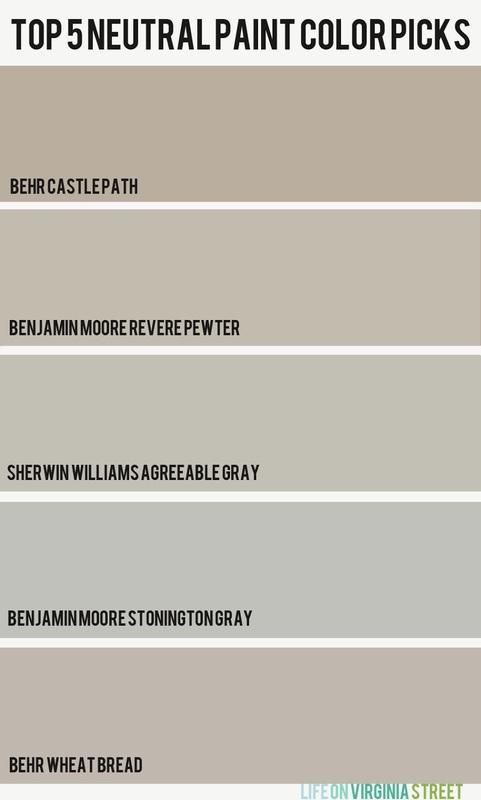 Right now my favorite of the five is Benjamin Moore's Revere Pewter which is FYI the color that I decided to go with on our remodel. Although these tips are in no particular order. I would advice painting the walls first, followed by rugs, then pillows and lighting in that order. Do you have a room that needs a fresh coat of paint?